We all built cardboard forts when we were kids. [Paintingcook] has taken it into adulthood with a hand built cardboard wall. He and his wife leased a loft apartment. Lofts are great — one giant space to work with. Plans changed a bit when they found out they had a baby on the way. A single living, working, and sleeping space definitely wouldn’t be good for a newborn, so the couple set about separating a section of the room with a wall. Sheetrock and steel or wood lumber would be the normal path here. They instead decided to recycle their cardboard moving boxes into a wall. The boxes were formed into box beams, which created the framework of the wall. The two pillars were boxed in and incorporated into the wall itself. The skin of the wall is a random patchwork of cardboard pieces. Most of the construction is completed with 3/8 ” screws and masking tape. Tape won’t last forever, but this is a temporary wall after all. You might be wondering about fire hazards — sure, cardboard burns more readily than gypsum board, but the apartment is outfitted with sprinklers, which should help on this front. A few commenters on [Paintingcook’s] Reddit thread asked about formaldehyde and other gasses emitting from the cardboard. Turns out he’s an inorganic chemist by trade. He says any outgassing happens shortly after the cardboard is manufactured. It should be safe for the baby. Cardboard is a great material to work in. You can build anything from robots to computers to guns with it. So get hop the couch, grab that Amazon box, and get hacking! What’s The Weather Like For The Next Six Hours? The magic glowing orb that tells the future has been a popular thing to make ever since we realized we had the technology to bring it out of the fortune teller’s tent. We really like [jarek319]’s interpretation of the concept. Sitting mystically above his umbrella stand, with a single black cord providing the needed pixies for fortune telling, a white cube plays an animation simulating the weather outside for the next six hours. If he sees falling drops, he knows to grab an umbrella before leaving the house. If he sees a thunderstorm, he knows to get the umbrella with the fiberglass core in order to prevent an intimate repeat of Mr. Franklin’s early work. The scale of this project is daunting. Each of the three white walls seen in the image above is made up of thousands of oblong square blocks. The blocks move independently and turn the room into an undulating 3D display. If it had only been the demonstration video we might have run this as a “Real or Fake” post, but we’re certain this is real. Each pixel is made of what looks like a foam block mounted on a stepper-motor-driven linear actuator. So basically this must have set the world record for the CNC machine with the most axes. The motors make for very accurate and smooth motion, and the control software lets them draw shapes, words, animated objects, and the like. But the one side effects that we absolutely adore is the sound all of these motors make when running. After the break you can see a demo video and a ‘making of’ clip. The installation is the work of the Jonpasang art collective and is installed as a Hyundai exhibit at an expo in Korea. This art installation uses a fantastic concept. 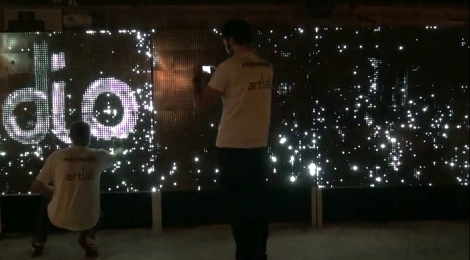 The wall can be painted using water as ink which lights up a huge grid of white LEDs. This offers a very wide range of interactive possibilities since water can be applied in so many ways. Grab a paint brush, wet your finger, use a squirt gun, or mist with a spray bottle and the lights will tell you where you hit the wall. We’re hoping a reader who speaks both French and English might help out by posting a translation as a comment on the prototyping video. In it, [Antonin Fourneau] shows off the various prototypes that led to the final product and we’d love to know what he’s saying. But by seeing the prototypes, then watching the English promo video after the break we can make a pretty good guess. The boards have a hole that fits the flat-lens LEDs perfectly. This creates a mostly water tight seal to keep the liquid on one side while the leads are safe on the other. The water side has squiggly pads which allow droplets of water to complete an electrical connection. Rotary tools such as a Dremel are useful to have around for all sorts of tasks in a workshop, including cutting, polishing, and grinding. [Konstantin] sent us in his home made wall mount rotary tool based off of parts from a blender and an old bench top jigsaw. Unlike a Dremel where the motor is in the hand held part of the tool, this setup hides the blender motor (which provides the power) behind a wall panel, and is controlled via the blender’s speed settings buttons. 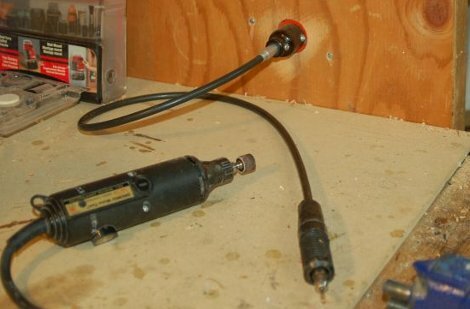 We could see this configuration allowing for more delicate work due to the reduction of weight in hand, as well as the added bonus of a near impossibility of losing this tool. Overall an excellent re-purposing of leftover parts, be sure to check out [Konstantin]’s blog for more build info and photos. 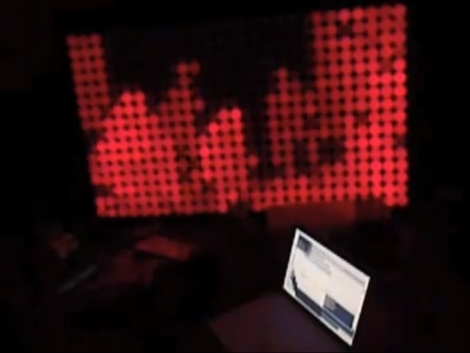 [Alex] wrote in to let us know about this Kinect controlled LED wall that was whipped up at the Tetalab hackerspace in Toulouse, France. The wall, which was built earlier in the year, uses some MAX7313 LED intensity controlling shift registers. Each gets its own board and controls the intensity of sixteen different red LEDs. They’re embedded in the wall module and covered with ping-pong balls as diffusers. The recent activity on the project takes advantage of the Xbox Kinect. As you can see in the video after the break, they’ve used the open source Kinect drivers to capture 3D environment data, processing it into color gradients which are displayed on the Pong wall. Shouldn’t be long before they someone comes knocking on their door to install this in a dance club. We love the effect, especially because it works in a dark room and the LEDs don’t cause any interference with the video capture. AWE is an interesting project, where your office wall is a helpful robot. That’s the goal anyway. The wall is articulated and can reconfigure its shape to fit your needs. You can see in their video that they have come up with several specific uses for AWE at different positions. We want to like AWE, we see that there is potential there. The video hasn’t won us over, there just wasn’t enough added benefit over a simple setup like a projector mount. We think the real benefit just isn’t as obvious. When we saw the girl stand up, and the wall back away intuitively, our attention was regained. What potential uses do you guys see? Alejandro Gomez liked Cyborg Eyeball Project. Tim Bertram has updated components for the project titled ESP8266 NodeMCU Konnected BeepBeep. Tim Bertram has added a new project titled ESP8266 NodeMCU Konnected BeepBeep. Indigaz liked mini (Pi)QWERTY USB keyboard. bobricius has updated the project titled 2.5D stepper motor on PCB - micro manipulator.